Aluminum bleachers can take up a lot of room in a gym. This is especially so when they’re not needed all the time. When a more practical solution is required, tip and roll bleachers provide the perfect solution. 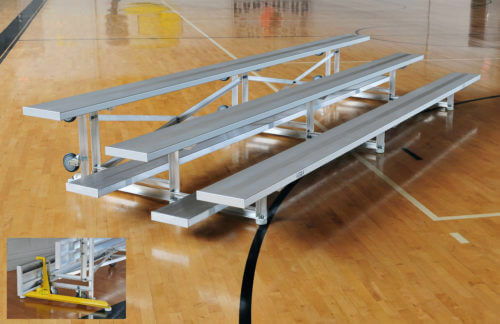 Unlike other indoor and outdoor bleachers, this design delivers the ultimate in flexibility. Just pull them out when aluminum bleachers are needed for special events and roll them away when they’re not. At SightlinesBleachers.com, we’re pleased to provide our customers access to a variety of tip and roll bleachers. From our home base in Kentucky, we’ve been serving customers all over the country for decades. In fact, we have more than 30 years experience in the industry and have earned a reputation for high quality products at highly competitive pricing. Although we specialize in aluminum bleachers, we also offer aluminum benches and aluminum picnic tables in our extensive inventory. When you’re in the market for bleachers, you’ll find that our designs are built for satisfaction. At SightlinesBleachers.com, we take quality and customer satisfaction seriously. That’s why all of our aluminum bleachers are built to last and meet strict safety codes. Three-row, 15-seat designs – If you need smaller aluminum bleachers to serve your event needs, we have the models you’re after. Our tip and roll designs are all constructed to meet or exceed IBC Codes. This means you can count on quality products built with safety in mind. The aluminum design of our bleachers enables easier handling and very quick cleaning, too. This 15-seat design weighs in at 172 pounds for easy transport. Three-row, 30-seat designs – Should more seating room be required in aluminum bleachers, this design delivers. Meeting IBC Codes, this design comfortably seats up to 30 people. Three-row, 42-seat – This is ideal for school gymnasiums where seating is required on a temporary basis. This aluminum design offers plenty of room for 40 or more people. This size is ideal for almost any size gym. Three-row, 54-seat – When a larger crowd is anticipated, this tip and roll design should serve perfectly. With seating for up to 54 spectators, these bleachers offer all the benefits of our other products on a larger scale. When your school or organization needs bleachers that can be easily set up and taken down, our tip and roll designs provide the perfect solution. Just browse our inventory to select the right aluminum bleachers to meet your needs. We also offer a wide variety of other designs for both indoor and outdoor use. Once you find the bleachers you want, you can order right online. If you prefer, contact us directly at 1-800-609-1545 for personal service. At SightlinesBleachers.com, we’re always happy to serve.